I’m excited that The Birdman’s Wife has been shortlisted in the literary fiction category for the Australian Book Designer Association’s 2017 book awards. I was privileged to work with Christa Moffitt of Christabella Designs, Fiona Henderson and Affirm Press on the cover, case, endpapers and page designs for The Birdman’s Wife. I have always loved fairy wrens, the genus featured on the cover of The Birdman’s Wife. I lived in Ipswich for some years, and my partner planted a beautiful native garden, which attracted a family of superb fairy wrens. We used to drink our coffee on the veranda and listen to their soft twitterings. It was on a twitch, early in my bird-watching career, that I first encountered red-backed fairy wrens, in the brambles along the banks of the Bremer River. A trip to Anstead Gardens revealed variegated fairy wrens, with their lovely chestnut wing coverts. During a stay at Bowra Conservation Reserve, we were lucky to encounter both white-winged fairy wrens, the males in their full summer colours of striking blue bodies, and white wings, along with splendid fairy wrens, still dressed in their winter plumage. Driving to Broken Hill, we tweeted white-winged fairy wrens, this time in their black hybrid morphs. Travelling in Tasmania, I saw superb fairy wrens again, and imagined what Elizabeth Gould must have felt, viewing these friendly, inquisitive backyard wood birds for the first time, alive and active. As part of my research to write The Birdman’s Wife, I travelled to Kansas, to the Spencer Research Library, where more than 2000 manuscripts, lithographs, drawings, sketches and paintings are stored, the preparatory work carried out by Elizabeth and John Gould and other artists to produce their magnificent plates. To my delight, I was privileged to view a signed sketch of the superb fairy wren by Elizabeth Gould, which became the lithographed plate in The Birds of Australia. It was my secret hope that Elizabeth Gould’s iconic lithograph of the superb fairy wren featured in the cover design for The Birdman’s Wife. You can imagine how chuffed I felt when my editor, publisher, and designer felt the same way. Christa Moffitt came up with the original design for the cover, which, through the visionary generosity of Affirm Press, was combined with endpapers that featured many of Elizabeth Gould’s most well-known designs for The Birds of Australia: the superb lyrebird, the satin bowerbird, the extinct norfolk island kaka, along with earlier designs, including the resplendent quetzal and mrs gould’s sunbird, named after Elizabeth Gould. And it didn’t stop there. I remember saying to my publisher at Affirm that my dream was to have a novel published. Little was I prepared for the sumptuous hardback that became the novel’s final design. 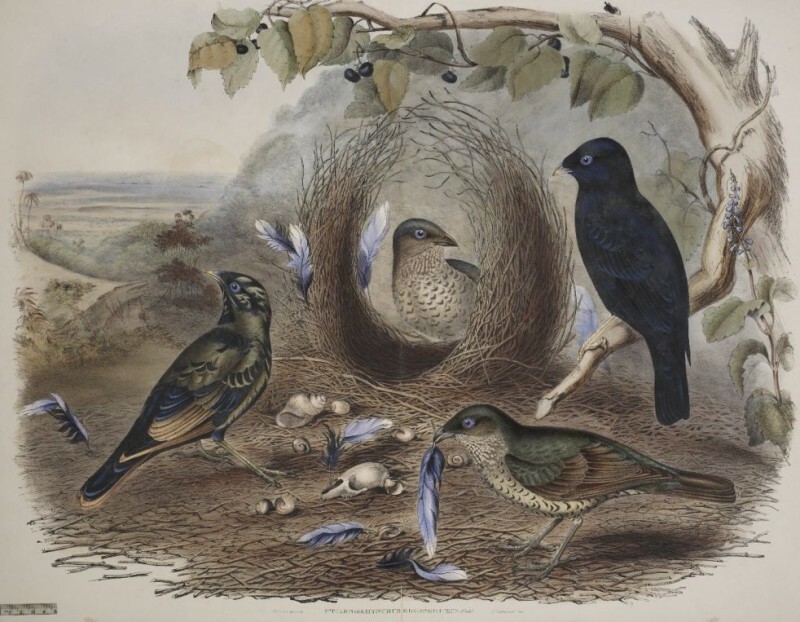 Not only does The Birdman’s Wife include full-colour endpapers, including a key to the featured species, there are other surprises inside the covers: an etching of the superb lyrebird, which John Gould thought was the species emblematic of the magnificence of Australia’s birds, but also uncoloured lithographic designs of eggs, budgerigars and swifts, to punctuate the novel’s three distinct parts. I’m thrilled that the extraordinary vision of Affirm Press, Christabella Designs and my commissioning publisher Fiona Henderson have been recognised by the Australian Book Designer’s Association in its 2017 shortlist.